Professional and efficient services from a long-standing company. Our aim is to provide you with quality products and resources from trusted partners. A range of quality products offered by our affiliated partners. Find telephone numbers, our e-mail addresses and feedback form. When I began researching the best Automatic Responder Software for my business I required a program that I would have full control over, and that could be hosted on my own web space so that I would not be paying monthly fees. I also wanted a program that had sufficient options to maintain a professional followup mailing service to my subscribers and in time would grow with my requirements. You may be tempted to try some of the freely available or cheaper autoresponder program scripts or online services, but with free autoresponder services you often have to put up with their adverts in your email messages which does not look very professional, and detracts from your business branding. Frequently free autoresponder services get locked out due to spamming by other customers using the service, and when this happens you might have problems transferring your list of subscribers to a new system. Your subscriber list will grow and become like gold...so I recommend treating it that way. I personally use and recommend AutoResponse Plus from ECom24 Ltd. It now also includes delivery using the new RSS module to guarantee your messages get through. Also freebies are often restricted to a maximum number of subscribers (say 500) before you have to pay, and many do not have a broadcast feature, meaning it will respond individually to new subscriptions, but will not allow you to broadcast a message to your whole list. Searching around I found that there are several similar if not identical scripts available for between $15 to $30, which go under a variety of different names (such as Autoresponder Unlimited 2.0). They are often exactly the same scripts, just badged and named slightly differently! I unwittingly tried two of these scripts, which on the sales page looked like different products, but behind their only slightly different looking user interface they had exactly the same features, layout and options, and they certainly were not Unlimited, in fact they were very limited. Generally these simple scripts are false economy and really not worth the effort. Unless you have very basic requirements from an autoresponder and have little money to spend, I would strongly recommend that you "bite the bullet" and pay for a decent autoresponder, because by the time you have installed a couple of the freebies and got fed up with their unreliability or lack of options you would have spent your time better on something more capable. Also an autoresponder is one of the "workhorse tools" of the Internet - it is your never-tiring salesperson who constantly promotes your business and products. Used correctly it will pay for itself many, many times over. Some people prefer to use online autoresponder services such as AWeber.com which are ideal for people who are less technically able and have concerns about installing programs on their own web space. The disadvantage of outsourced autoresponder services is that they sometimes include advertising banners, and charge a monthly fee which in due course could cost many times the price of owning your own software. However, of the various outsourced services available AWeber.com does NOT force adverts into your messages, and is probably the longest established and most highly featured and respected. 2. Add2It Auto Respond Pro from Add2It.com. This was a hard choice but ultimately I felt that the product from ECom24 had the edge with its easier to use interface, and was more suited to my web space where I already use a MySQL database for other purposes. Using AutoResponse Plus I am able to provide professional looking follow-up mails and information to my subscribers from any of my web sites. Sending automated follow-up emails in response to online subscriptions for my product newsletters has dramatically increased my sales orders. With AutoResponse Plus you get an extremely well featured professional list management system, that runs on your own web space. It requires MySQL and Perl (also PHP for open-rate tracking). These come as standard with most web hosting providers nowadays. ECom24 will perform the installation free of charge if you require, so alleviating the worry of setting up. ECom24 also have an excellent support team who provide a quick response to any queries or problems. I know this from first-hand experience as they were very helpful on the odd occasion I have required it. AutoResponse Plus is in my personal experience and opinion an excellent autoreply program and currently retails for $195. Now you might consider this a little high if you've seen other products retailing below $100, but this price includes FREE installation if you require it. Also bear in mind as I pointed out earlier that a different $99 product does not necessarily mean you get well featured quality software. There is no guarantee! Indeed I have seen the same cheap $15 script discussed earlier also being sold for $97 !! I highly recommend you to take a look at ECom24 AutoResponse Plus web site to review the many benefits an autoresponder can provide you, and you will see the extensive list of features this program has. You might be forgiven for thinking that there are too many features for your needs in AutoResponse Plus, but believe me, once you get your autoresponder in full swing, you will begin to use those extra features, and would be kicking yourself if you didn't have them in the first place. You should also consider that one of the upcoming buzzwords nowadays is RSS (Really Simple Syndication), which is a relatively new technology for feeding regularly updated information and content to people who request it, and it is rapidly becoming very popular with Internet users. Whilst email often fails to reach its recipient due to spam filters, RSS works because people are "requesting" information of their own accord. AutoResponse Plus is one of the very few autoresponders to have embraced RSS as an additional method to email for marketing your business. Click here for ECom24 Ltd to see a demo and learn about AutoResponse Plus various features. Once you have got your autoreply software up and running you will need to prepare your autoresponse sequences - the messages your autoresponder will send at set intervals once people have subscribed to your list. To help give you ideas you can download the popular ebook AutoResponder Magic which is a perfect illustration of viral marketing, but gives excellent advice and examples on creating your own message sequences. Click here to download a FREE copy of AutoResponder Magic (normally retails at $17). If you are thinking of running your own follow-up autoresponder software, there are some things you should be aware of as there can be a few pitfalls and drawbacks of such a solution. You should think about the following points carefully before you go ahead. Make sure that the software sends the outgoing emails in batches and not in one shot (e.g. just once at midnight). Your ISP may have set restrictions on out-going email, for example allowing only 500 per hour, and if you try to send emails out to all your subscribers - or to those in your autoresponder series - in one go (e.g. 5,000 mails), most of the emails won't get delivered. AutoResponse Plus caters for this by running in a responsible fashion. Autoresponder software require you to be able to run a 'cron job' (a scheduler which triggers your autoresponder program at a pre-set time, say every 1, 6 or 12 hours). Not all web hosting providers offer this. Ensure that your ISP does. Make sure that the software can also be triggered manually - through a cgi program, started from within a web browser - in case you can't run cron jobs on your web server. AutoResponse Plus is capable of this. System resources - autoresponder programs can really hog your CPU and mail server resources as your list grows. Make sure your host will not cut you off without warning because you could end up losing money, time and your peace of mind. AutoResponse Plus caters for this by running in a responsible fashion. Spam troubles - ISP's are so fed up of spammers, that they will shut you down first and ask questions later. So, one of the biggest risks of running autoresponder software on your main business web site, is that if someone complains - whether it is a legitimate complaint or not, your ISP might shut down your mailing list, your mail server and possibly even your web site, before questioning you further. So nasty or forgetful subscribers reporting your email to spamcop could possibly bring down your entire business. Obviously the key here is to use your mailing list responsibly, by being courteous to your subscribers in the first place, building a good relationship with them, keeping true to the topic of your subscriber base (i.e. using the list for the reasons your subscribers opted into your list for in the first place), and to respect their wishes by unsubscribing them promptly when requested to do so. Autoresponse Plus has a variety of options to maintain a professional format for your messages and to allow for automatically unsubscribing. Maintenance - Autoresponders are database driven programs. If something breaks or doesn't work as intended, including your data base, unless you know how to fix it, you could end up spending a substantial amount of time troubleshooting (like hiring a freelance programmer). AutoResponse Plus has easy to use data backup procedures built-in to enable you to regularly takes backups so that you can easily get back to a known state if something goes drastically wrong. Stats - What kind of statistics are offered? If you use HTML email, the service may track links, open rates, etc. for you. AutoResponse Plus offers both open rate tracking and campaign tracking so you can also tell which links in your emails have been followed. Can you easily export your list data, including IP addresses? If you are moving a list, will the new service allow you to import your subscribers or will you have to ask them to reconfirm their subscriptions? AutoResponse Plus allows both importing and exporting of subscribers list data. If you don't understand the difference between a CGI bin and a trash bin!, or if you hate tinkering with stuff, then you may be better off running your mailing list from your desktop using appropriate local software, or by outsourcing the service to a provider like AWeber.com. 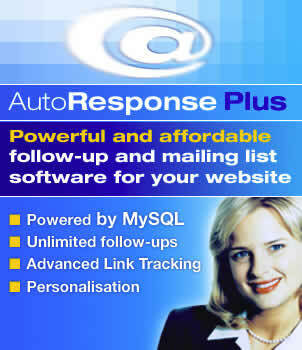 As mentioned earlier ECom24 provide a free installation service included in the price for AutoResponse Plus.